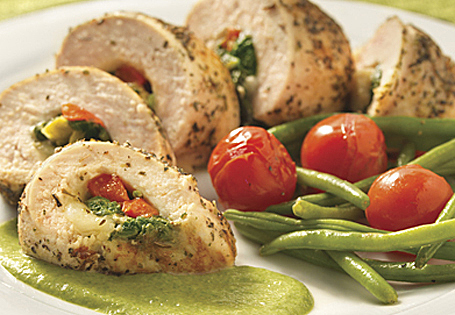 Chicken stuffed with provolone, spinach, red peppers and artichokes, served with a spinach cream sauce. In a sauté pan, heat 1 tablespoon of olive oil and 1 teaspoon of garlic over medium heat. Sauté peppers for 3 minutes until tender. Add ½ of the artichokes and ½ the bag of spinach; cook until the spinach has wilted. Add 1/8 teaspoon salt and 1/8 teaspoon pepper. Remove from pan and reserve. Add 1 tablespoon of olive oil to the pan and sauté the remaining spinach until wilted. In a blender, puree remaining sautéed spinach, remaining artichokes and alfredo sauce until smooth. Heat in saucepan. Reserve. To prepare the chicken: Butterfly each breast, cover with plastic wrap and pound each to a 6x6-inch square. Remove plastic and top each breast with 3 slices provolone and a thin layer of the spinach-pepper mixture. Roll the chicken tightly, end to end. Tie each roulade with four pieces of kitchen twine. Sprinkle with ½ teaspoon salt, ½ teaspoon pepper and Italian seasoning. In a sauté pan, heat 3 tablespoons of oil over medium-high heat; sear each roulade until golden brown on each side. Place on a baking pan and finish the chicken in the oven for 10-15 minutes until it reaches an internal temperature of 165°. Allow the chicken to rest. Meanwhile, heat 2 tablespoons olive oil over medium-high heat with 2 teaspoons garlic. Sauté the green beans and cherry tomatoes until the tomatoes pop. Add 1 teaspoon salt and ½ teaspoon pepper. Slice each roulade into 1-inch-thick slices. Spoon some of the alfredo sauce onto each plate, top with roulades and serve with green beans.